Hyderabad- June 4, 2018 : Intense Technologies amongst Business Automation ‘leaders’ in Aspire Leaderboard™ Aspire Leaderboard™ - a digital first CCM vendor positioning portal developed and marketed by Aspire. 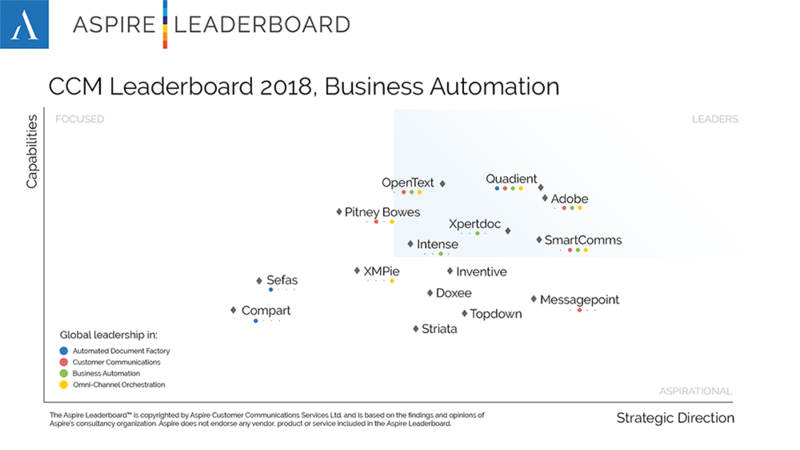 Intense Technologies has been positioned in the Aspire Leaderboard™ grids of Business Automation as ‘Leader’ and as ‘Focused’ in the Overall Leaders for CCM, Customer Communications and Omni-channel orchestration. “Intense Technologies performed well in the 2018 Aspire Leaderboard, due to its strengths in business automation, the company’s focus on deploying its software as a low-code development framework, as well as employing new technology such as Robotic Software Automation. It is also seeing more success outside of its South Asian home market." KasparRoos, CEO & Founder, Aspire. Aspire Customer Communications Services is a boutique consulting firm specializing in the Customer Communications Management (CCM) and Digital Customer Experience (DCX) industries.Through deep market expertise and global insights, Aspire works with technology providers, service providers, enterprises and investors to help them achieve their CCM goals. Find more information about how Aspire is helping organizations navigate the complexities of the customer communications world at http://www.aspireccs.com. Intense Technologies Limited is a global enterprise software products company, headquartered in India with a strong and emerging presence in USA, LATAM, EMEA and APAC. Our enterprise software products are used globally by Fortune 500s for digital transformation of customer centric business processes resulting in improved revenues, greater customer centricity and reduced operational expenses. We have customers in more than 45 countries and have established ourselves as formidable players in the domains that we operate. We help onboard more than 2.5 million customers every day; we send more than 200 million notifications in a day. Our solutions have been built for scale and have played a crucial role in enhancing customer experience across all our implementations. Intense Technologies has sales offices in Singapore, UAE, USA and UK.